Gigi Sliger lives in America. She has played the piano for years and like many people do she started to teach a few students. It wasn’t until recently that Gigi decided to turn her love for piano teaching from a hobby into a fully functioning business. “I used to teach one or two days,” Gigi said. Gigi accredits her piano teaching studio transformation to her dedication, passion and also the support she found from the Inner Circle – a creative and supportive community of teachers from around the world. “My piano teaching studio was a side job and I had always had a full-time job,” Gigi said. The Inner Circle provides teachers with creative resources so they can inspire their students. Gigi said one of the main benefits she has found is that the Inner Circle has given her new ideas and approaches to teaching piano. “I love looking at everything in the community and taking things from here and there,” she said. “I have done a lot of the group teaching courses, which spurred me on to think outside the box and include that in my studio. I now have a business Facebook page and a private group for my students and parents. I created a website too and started using those resources to help me with that. The Inner Circle’s latest feature is the Piano Teaching Roadmap. We have organised all of our content to help you expand your business and teaching no matter what stage of career you are at. The Roadmap has six stages – read more about it in this blog post here. As Gigi puts it, piano teaching can be a lonely job. Especially if you teach from home during the day, a lot of teachers find out quite quickly they don’t have a whole lot of support. “The Inner Circle has forums where teachers come together and discuss ideas and share knowledge and support,” Gigi said. With a group of dedicated piano teaching experts as well as hundreds of teachers from around the world, there will always be someone on hand in the community to help you with a question or concern you might have. “You won’t regret joining the Inner Circle, no matter where you are in your teaching career,” Gigi said. Joining the Inner Circle comes with a payment but by budgeting for it the monthly or annual membership quickly becomes achievable. Gigi said she charged her students an administration fee, which her piano parents welcomed. “I have started a small registration fee to help pay for my membership,” she said. 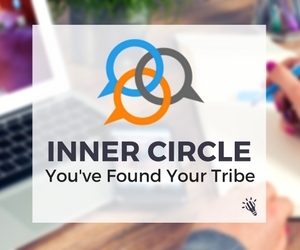 “Really, joining the Inner Circle was worth it to me because it has helped my business grow, so that’s how I justify it. I justify it by how much it has transformed my piano teaching studio, so it’s worth it no matter what. The Inner Circle is all about providing teachers with direction. Gigi said after going from teaching one day to four days a week she was now focused on her next ventures. “I want to add a lot more group classes – the local music store will rent me their group room,” she said. “I will probably end up changing my whole private lessons to be a bit longer and look at partner lessons too. I am working on a blogging course and my website. I am also a yoga teacher and am combining my whole music and yoga teaching and living a creative life. “I have a podcast idea for my students too to share musical stories. I have been looking at some studio space to move into because I feel like I’m growing and running out of space at home. That would allow me to offer more things. I’m looking to add some adult classes too. I just am continuously learning new pedagogy lessons and more creative teaching methods. The Inner Circle isn’t for everyone, but if you are a motivated teacher who wants to embrace modern teaching practices, it could be for you. If you’d like to know some more information on the Community and how 30-day money back guarantee, click here.